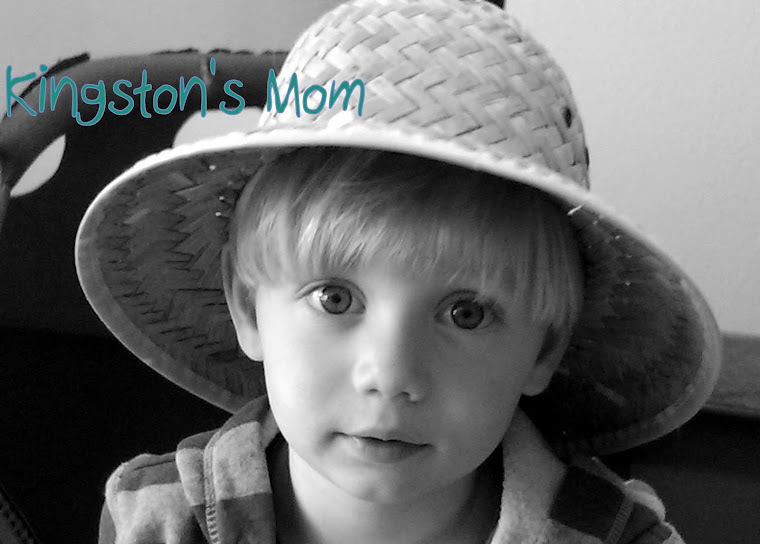 Kingston's Mom: Happy Mother's Day! To my mom, Happy Mother's Day. You are the best. For your present, I will post a bunch of new pictures of Kingston. That's a good gift, right? I knew you would love it. Mom got Kingston new shoes to wear to the wedding on Saturday. He tried them on sans pants and they fit just right! Well, maybe they were a bit big but he only ended up tripping over them a few hundred times. Before we left for the wedding (Amber, Nigel's cousin got married), Kingston looked really spiffy. After the hour and a half in the car he was a bit rumpled but still lookin' good! His shirt only stayed tucked in long enough to get into the church but that was OK, too! Not the best picture of us, but the only one we took. Or had taken. However you want to look at it. The reception was tons of fun. Kingston was such a good boy. He especially liked Nigel's cousin, Jessica's little girl, Leah. She could crack him up like no one else! We didn't get home until 11:45 last night but we had a good time. I was almost still up when Nigel got home from his trip. Well, not exactly almost, since he got in at 4 a.m., but I was up later than I have been in a long time! We are so happy to have Dad home! He is pretty worn out from his travels but he did manage to take us to the beach for a bit this afternoon. Our first family beach day of the year! The water was cold but Kingston really doesn't care. He walks right to the water and would walk right out to sea if you would let him. We discovered a new trick that Kingston has added to his bag of tricks. He has figured out how to get into the bath tub all by himself. Sounds pretty harmless except for when he climbs in right after you have put him in his clean jammies, which you have put on him right after he has gotten out of the tub. The tub is still wet, you know? Oh, well. It's just water. And another pair of jammies. Overall, a good weekend. And a great Mother's Day, thanks to my sweet family. Did you like your pictures, Mom? Happy Mother's Day to the most Motherly Mom on the planet. Now, try to keep the sappy comment to a minimum ;) ! "mama", wife, and daughter. I am so proud of you and love you so very much! Cute pictures! Kingston is looking so grown up! Happy Mother's Day to you and your mom. Such adorable pictures. Glad you had a nice Mothers Day! So glad hubby is home! Cute pics! Love the new shoes! You both looked great at the wedding!! We Made It! ***Updated w/ pictures!